Tales of impossible love and the trappings of fame and fortune have long been staples of Hollywood cinema. However, to accuse Gina Prince-Bythewood’s Beyond the Lights (2014), a romantic melodrama about the human price of stardom, of being derivative would be to ignore the significance of its message. A rebuke to the misogyny of the music industry, Prince-Bythewood’s latest is a quietly radical appropriation of mainstream narratives that aims to challenge the status quo. A brief Brixton-set prologue establishes the strained relationship between Noni (played in her youth by India Jean-Jacques) and her competitive mother, Macy Jane (Minnie Driver). The only non-white child performing at a talent competition, Noni’s tender a capella rendition of Nina Simone’s Blackbird wins her second place, much to the chagrin of her mother who, believing her daughter was robbed of first place because of her mixed race ethnicity, forces Noni to abandon the trophy. Fast-forward ten years and this heartbroken girl is transformed into a scantily clad diva on the brink of stardom. Garbed in leather lingerie and purple hair extensions Noni (now placed by Belle star Gugu Mbatha-Raw) is a clear mirror image of modern R&B stars like Rihanna, manufactured to appeal to male fantasies and, throughout the remainder of the film, Prince-Bythewood attempts to peel away this industry fabricated veneer and re-discover the young girl who bared her soul on that South London stage. Disenfranchised with her Beverly Hills lifestyle and the realisation she’s become a slave to her public image, Noni attempts to take her own life by jumping off the balcony of her hotel suite but is rescued by Kez (Nate Parker), a police officer with political aspirations. Kez has a proclivity for inspirational quotes, with one in particular; “truth is the only safe ground to stand upon” by American suffragist and women’s rights activist Elizabeth Cady Stanton repeated at various key moments throughout the film. A believer that the prejudice endured by women and African Americans is produced by the same cause; Cady Stanton’s spirit is ever-present in this stunningly entertaining and adroitly handled deconstruction of the male-oriented gaze and the racial inequality of the entertainment industry. How Noni is seen is the film’s primary dramatic device, with Prince-Bythewood using lighting and composition to show the delineation between the flashbulb-lit catwalk of Noni’s Beverly Hills existence and her private life. Mbatha-Raw is exceptional in the duel role of Noni, equally believable as a captivating stage performer and as a vulnerable commodity whose autonomy is being stripped away. Prince-Bythewood’s appropriation of genre tropes leaves the film open to a series of clichés, yet thankfully the physicality of both Parker and Mbatha-Raw’s performances adds some much needed gravitas to the film’s habitually hackneyed dialogue. There’s one tremendous scene halfway through the film that encapsulates Beyond the Lights. Noni, fresh from breaking up with her white rapper boyfriend Kid Culprit (Richard Colson Baker), is performing alongside her ex during a televised awards ceremony where she’s meant to strip down to her underwear. Culprit’s previous ambivalence to their break-up takes a nasty turn when Noni refuses to take her clothes off. The sequence plays out like a lurid ballet of the exploitation central to Noni’s life, with Culprit half-pretending to knock-her about a fitting metaphor for the misogynistic mechanisms behind an industry built on the objectification of women. 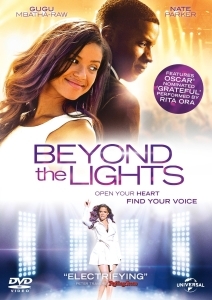 Just like Simone’s Blackbird, Beyond the Lights is an emotional expression of oppression that beautifully portrays the pain and optimism that only true art can encapsulate.